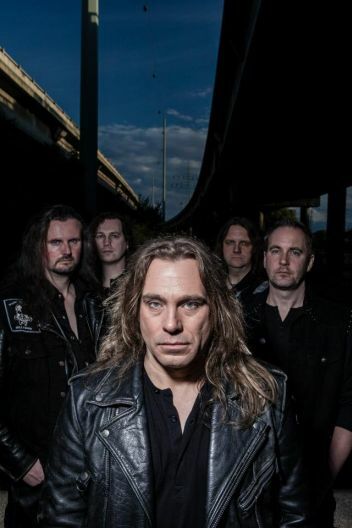 In the realm of classic German power metal, the rise to royalty for bands like Grave Digger, Helloween, and Accept is well documented. Perhaps not as well known are the bands that fill the ranks of the minor nobility such as Chinchilla, Mob Rules, and Paragon - all of which have toiled in the scene nearly as long (or longer) than the greats but for whatever reason have never usurped the throne. Hamburg's Paragon, for instance, was formed in 1990 and has issued album after album of Accept-like heavy metal (10 LPs in all) yet never managed to emerge as more than a second-tier act. 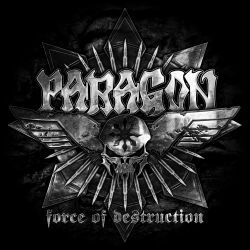 This year's Force of Destruction release continues the trend for Paragon, being an enjoyable example of Teutonic power metal that sticks to the tried-and-true formula without taking many risks. What I liked most about Paragon's Force of Destruction was not so much the music itself, but the production values employed by Piet Sielck (Iron Savior, ex-Savage Circus). Eschewing flawless polish for a more rough-around-the-edges approach, Sielck manages to give the album a tone that resurrects the glory of mid-'80s metal. The production, coupled with Andreas Babuschkin's vocal style making it impossible not to mistake him for Udo Dirkschneider, sets the stage for Force of Destruction to be a hit with fans of vintage power metal. The first proper song on the album, "Iron Will", lures listeners with galloping riffs and no-holes-barred solos before springing a trap of infectious gang choruses. "Tornado", "Bulletstorm", and essentially the remainder of Force of Destruction follows the trail blazed by "Iron Will" with slight variations here and there to help hold interest. Guitarists Wolfgang Tewes and Jan Bertram, both newcomers to Paragon since the band's previous album Screenslaves, execute their duties skillfully and with noteworthy flair. Neither of the two are excessively flagrant with their leads or solos, both instead complimenting their bandmates to produce a tight, cohesive assault. While most of the album is well-executed, but somewhat nondescript, tracks such as "Gods Of Thunder" and "Dynasty" rise above the rest to give a glimpse of what Paragon could accomplish...if only. The chugging, impressively hefty riffs of the former track are delivered at a slightly reduced paced than the preceding songs. Underscored by robust bass lines courtesy of Jan Bünning, Babuschkin does his best Udo impression to cement the overall Accept-worship that this track exudes. The rousing refrains, classic sounding solos, and twin-guitar noodling further propel this track to the album's top spot. "Dynasty", while not as expansive as "Gods Of Thunder", still stands out for its nicely crunchy riffs and sweeping refrains. This track also contains a smattering of keyboard accents, further adding to the '80s appeal. Setting the two standout tracks aside, there's still nothing on Force of Destruction to derail the album from being considered a quality slab of German power metal. The only knock that can be made against the album is the same issue that Paragon has had with all of their releases - the album is just too generic. What Paragon does, is done well. It's just that so many other bands of their ilk do it as well or better. Nevertheless, if this is your style of metal then by all means add Force of Destruction to your shelves.